Today, we’re excited to launch our newest integration from our partnership with Facebook, Facebook Offline Conversions. 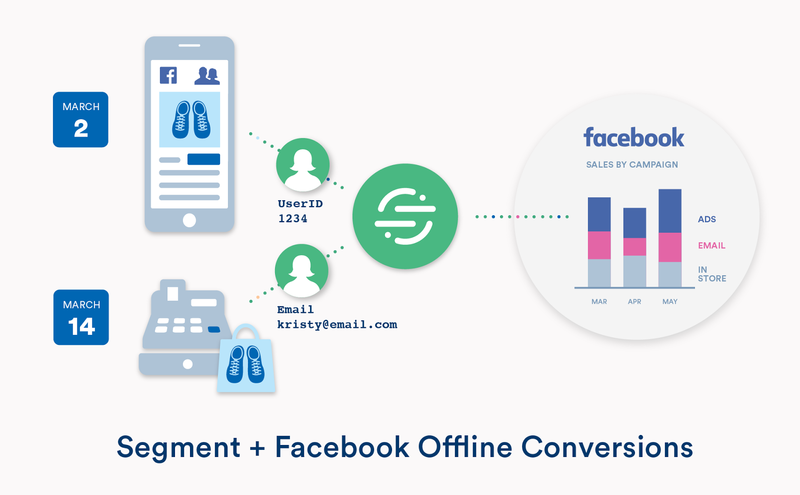 With the Segment and Facebook Offline Conversions integration, you can now understand how advertising on Facebook affects revenue in stores and other offline channels. Our integration enables a broad set of use cases, allowing you to understand the down-funnel effectiveness of your Facebook ads in real-time. Segment’s unique integration with Facebook Offline Conversions allows you to use Segment’s server-side libraries to send transaction and event data from your back office systems, customer database, call center technologies, appointments, or point-of-sale system, directly to Facebook. Historically, it’s been difficult to attribute offline activity to online advertising. As an example, one of the biggest challenges for brick-and-mortar stores is to measure how their online advertising campaigns actually impact their in-store sales. Facebook Offline Conversions allows an advertiser with purchase data to match this data against their Facebook ad campaigns, and measure whether a customer who purchased something in store saw an ad on Facebook. Without Segment, advertisers have to manually gather this data, and upload a CSV into Facebook. This powerful integration enables you to send these events directly to Facebook as they occur, eliminating multiple steps and expediting the process so you can measure and optimize your campaigns more quickly. Segment’s tracking API offers a flexible, platform agnostic way to collect data about the interactions you have with your customers. The most common way for retailers to capture transactional data and forward it to Segment is to forward data according to our ecommerce spec from their backend, ERP, POS, or OMS software. This allows you to understand and act upon the full checkout funnel across vendors and platforms, now including offline conversions, in Facebook. In addition, because Segment also keeps a record of the transaction in your warehouse, it can also be used by your email marketing software, analytics tools, and the over 180 integrations available on Segment. Segment’s partnership with Facebook spans multiple products, including a source for Facebook Ads, a source for Facebook Lead Ads, an integration for Facebook Pixel for Web Data, and an integration for Facebook App Events for Mobile Data. With the addition of Offline Conversions, you finally have a fully cross-platform view into your customer behavior like never before. Facebook uses their multi-screen touch points with your customers to reconcile this cross-platform data into cohesive customer profiles using event source groups. With Analytics for Apps, you can use your first party data from all three integrations and and combine it with Facebook’s rich demographic data to understand what factors and features are driving engagement, retention, and conversion for your business. You can create audiences of users based on this data and seamlessly operationalize those insights by sending that audience to Facebook Ads for retargeting. With our Facebook Offline Conversions integration, Segment enables you to use all of your data to grow your business through Facebook. You can get started with the Facebook Offline Conversions integration today. See our documentation for more information.